HOUSTON (AP) — In his first public comments since his wife's death, former President George H.W. 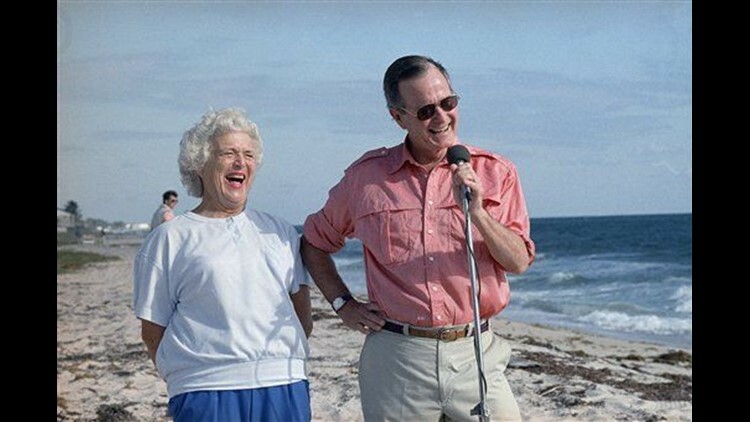 Bush said Wednesday that he used to tease his spouse of 73 years that he had a complex about how much people liked her. That fact, he said, is buoyed by stories about Barbara Bush's warmth and wit following her death. Tributes have rolled in from around the world, from former Soviet leader Mikhail Gorbachev to a U.S. Navy commander, who recalled Mrs. Bush handing out cookies to sailors on a battleship. "I always knew Barbara was the most beloved woman in the world, and in fact I used to tease her that I had a complex about that fact," the nation's 41st president said in a statement released Wednesday. His wife died Tuesday as their Houston home, where he held her hand, all day, before she died at age 92. They had been married longer than any other presidential couple. The former president referred to his wife as "The Enforcer," a term of endearment bestowed by her family as she ran their household while he pursued careers in the Texas oil business and later politics and public service. He said the outpouring of support and friendship toward his wife following her death "is lifting us all up." Their son, former President George W. Bush, told an audience at his presidential library in Dallas on Wednesday that his mother was "funny to the end." He recalled a phone conversation they had this week. "The day before she died, I said 'Mom, I just want you know you've been a fabulous mother and I love you dearly.' And she said, 'I want you to know that you're my favorite son — on the phone,'" Bush told the audience. "I hope you don't feel sorry for any of us, particularly me," he added. He said he was at peace because his mother was at peace. "She believes in an afterlife and was joyously looking forward to that afterlife," he said. A tearful Laura Bush added that watching her mother-in-law taught her "how to be a first lady, and I'm so grateful for her example." Current first lady Melania Trump, who will attend Barbara Bush's funeral on Saturday in Houston, praised her for putting "family and country above all else." Among her greatest achievements, President Donald Trump added in a statement, "was recognizing the importance of literacy as a fundamental family value that requires nurturing and protection." Gorbachev, whose last years in office overlapped George H.W. Bush's presidency, remembered Barbara Bush as warm and astute, saying "she immediately developed a warm relationship" with his wife. Gorbachev visited with the Bushes at the former president's library at Texas A&M University, where Barbara Bush will be buried. Kuwaiti leader Sheikh Sabah Al Ahmad Al Sabah sent letters of condolence to the Bush family, according to the state-run news agency KUNA. The Arab nation has long celebrated George H.W. Bush for securing its freedom from Iraqi occupation in the 1991 Gulf War, and Barbara Bush was warmly welcomed when she visited Kuwait in 1993 and 2001. Barbara Bush's funeral will be held at St. Martin's Episcopal Church, which she and her husband regularly attended. The church will host a public viewing Friday. The funeral Saturday will be by invitation only.